A couple of months ago, I was interviewed by fellow food blogger Meghan, from the blog Cake ’n’ Knife. Among other questions, she asked me what my ultimate favorite meal was. I didn’t even think twice about answering that Mole is my most favorite dish of all time (my mouth’s watering just from thinking about it right now). Why might you ask? I guess it’s its combination of sweet and spicy flavors, but that’s not the only thing that makes it special. It’s what this dish represents in Mexican culture. When someone says that we’re going to have mole for lunch, you know that it’s a special occasion like a birthday, wedding, graduation, etc. It is truly an extraordinary meal. 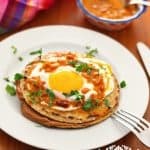 If you’re familiar with this blog, you might know that I have the recipes for Mole Poblano, Enchiladas Tabasqueñas, and Mole Casserole, but there are plenty of more uses for the Mole sauce in Mexican Gastronomy, such as baking tamales with it, serving them with nopales (Nopalitos con Mole), or simply topping fried eggs with it for breakfast (this is a favorite here at home). Meanwhile, add the vegetable oil in the other frying pan and turn the heat to high. Once the oil is hot, turn down the heat to medium and start frying the tortillas in a fast pace, turning once. The tortilla should turn soft but without any excess oil. Place the tortillas over the paper towel-covered plate to absorb the oil. Keep them warm. After frying all the tortillas, dip them one by one with the help of kitchen tongs (or your hand and a large spatula) into the warm mole sauce, making sure it is completely submerged. This is also a step that’s done quickly, to avoid breaking the tortillas. Place the tortilla on a plate and add the chicken filling right at the center. Fold the tortilla and, with the help of your spatula, place the enmolada on your serving plates. If needed, spoon some more mole sauce over the enmoladas. Just before serving, garnish with the crumbled cheese and finely sliced onions. Chicken Mole Enchiladas. 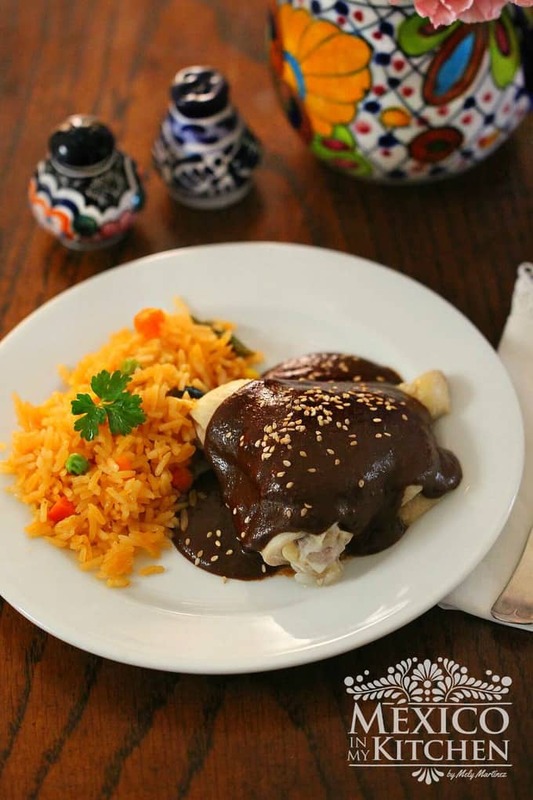 Here’s another very common dish that takes advantage of the leftover Mole sauce: Enmoladas filled with chicken. You can also just fill them with crumbled cheese if you prefer. 1 1/2 cup Mexican fresh cheese crumbled. 1/2 medium size white onion thinly sliced. Lettuce and radishes for garnish or any salad that fits your taste. You will need two frying pans. 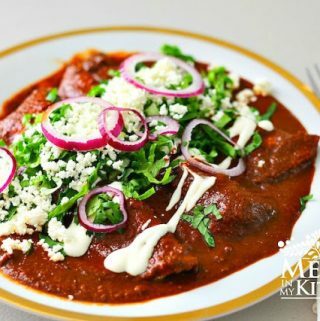 Place the mole sauce in one of the frying pans and set over medium low heat. Have a plate covered with paper towels ready. Place the tortilla onto a plate and add the chicken filling right at the center. Fold the tortilla and, with the help of your spatula, place the enmolada on your serving plates. If needed, spoon some more mole sauce over the enmoladas. (I use one plate exclusively to assemble the enmoladas before placing them on the serving dish). Just before serving, garnish with the crumbed cheese and finely sliced onions. • Have all your ingredients ready, since this is a dish that requires you to assemble it quickly. 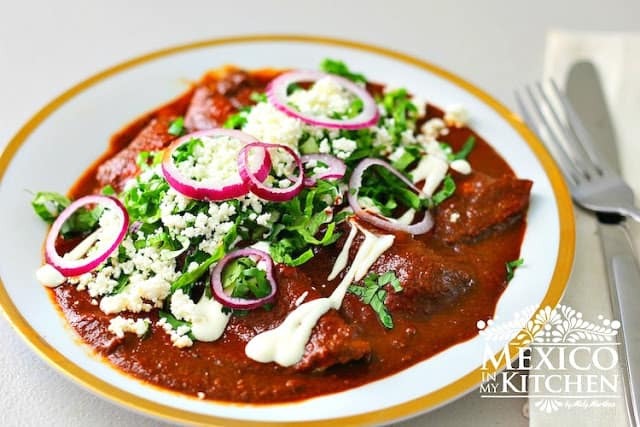 • Enmoladas or any other enchiladas are best served as soon as they are made, that means that the chicken must be already shredded and warm, and the mole sauce and any garnish you plan to use already at hand. • If you are using a Mole paste, then dissolve it using hot chicken broth in a skillet until you have a smooth sauce. • You can also use leftover rotisserie chicken. • If you do not find Mexican Fresh Cheese, use farmers cheese, ricotta cheese or parmesan cheese (for those living in other countries where it is hard to get). What is your ultimate meal? Mmm, looks good, Mely! I have lots and lots of favorite meals, but I think spaghetti and meatballs tops the list! Mole es también mi favorito, y toda clase de antojitos mexicanos hechos con masa de maíz. Las enmoladas eran favoritas de mi mamá. Me encantan! I can't wait to try this using some grilled chicken this summer. The mole will be fantastic. Pinned it! I usually made my own mole paste, but had tried the one made buy small companies, and those taste really good. Check my amazon store, there are some offered there. The corn tortillas I bought (Ole Mexican) are already soft and flexible. Is it still necessary to fry them? In that case, just warm me a little bit or directly dip them into the mole sauce. When you fry the tortilla, it prevent the tortillas from breaking, but every brand of tortillas of different. Have a great time cooking!